“Spin to win” became Australia’s new catchphrase as their slow bowling duo spun a web around West Indies. The combination of Nathan Lyon and Adam Zampa was augmented by Mitchell Starc‘s return from foot surgery, and the left-armer added considerable venom to the cause even if his control is still some way short of his 2015 best. 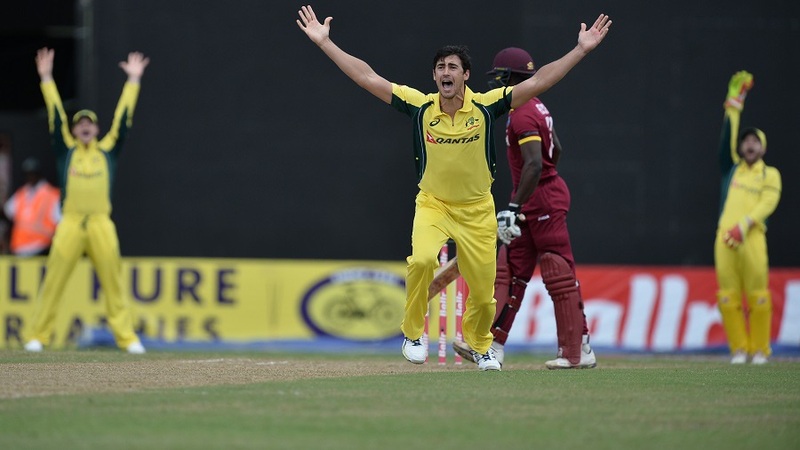 Much had been made of Starc’s recall, but it was the spin of Lyon, Zampa and Glenn Maxwell that mired the hosts on another sluggish pitch at Providence Stadium in Guyana. From 50 for 1, West Indies were rounded up for 116. Even though Sunil Narine and Sulieman Benn were also able to extract considerable turn, that was nowhere near enough to adequately defend against David Warner in his post-IPL afterglow. Not included in Australia’s World Twenty20 campaign in India earlier in the year, Lyon bowled beautifully and might easily have had more than three wickets. The umpires set a high bar for lbw decisions from deliveries straightening down the line of the stumps from around the wicket. Umpiring vagaries aside, Lyon was aided by a canny spell from Zampa and an effective two-over cameo from Maxwell. Their variations made life difficult for a West Indies batting line-up lacking in composure – the three spinners contributed combined figures of 17.3-3-58-7. Zampa’s stint included artful use of line and pace to find a way through the West Indies captain Jason Holder. After the start was delayed by 10 minutes due to damp patches in the outfield following earlier rain, captain Steven Smith bowled first in expectation of some early swing and then spin later on a slow and tacky surface. He was to be vindicated in the first over when Andre Fletcher narrowly avoided falling lbw due to an inside edge when Starc swerved the ball back in late, and then departed a few balls later by slicing a fast ball angled across him into the safe hands of Maxwell at backward point. Darren Bravo and Johnson Charles prospered briefly with a stand that took West Indies to 50 for 1, but Lyon had already begun to cause some awkward moments by the time Mitchell Marsh coaxed Bravo to push a catch into the juggling hands of Zampa at extra cover. Smith followed up the wicket by bringing Starc back on, a decision rewarded by a screeching yorker that plucked Charles’ leg stump off an inside edge. Starc’s radar was occasionally astray, particularly in delivering numerous full tosses, but his speeds were seldom much slower than 150kph. From there the middle order was flummoxed by Lyon, Maxwell and Zampa, as the bowling, the pitch and some hare-brained batting all contributed. Marlon Samuels was unable to cover an off break that would have struck leg stump. Off the next ball, Kieron Pollard was beaten in flight and pouched by an exultant Warner at long on, and Denesh Ramdin was not far enough down the wicket to ward off an lbw verdict in Maxwell’s favour. Zampa allowed Holder and Brathwaite to cut him on a few occasions, before he whirred down a faster, flatter delivery held down the seam. Skidding rather than gripping, it was under Holder’s bat before he could adjust, and the off stump was tilted: a fine piece of deception. The bespectacled Sulieman Benn offered Lyon the tamest of return catches, leaving Brathwaite to try to salvage some sort of total for his side before he too was deceived by Zampa. This all felt a long way from Brathwaite’s moment of glory at Eden Gardens a few short months ago, and even with the wiles of Narine in harness, West Indies had only the faintest hope of staving off a successful Australian chase. Any thought of a nervy chase was to be swiftly banished by Warner, who maintained the superlative batting touch that allowed him to guide Sunrisers Hyderabad to the IPL title. Busyness personified, he pushed hard when running between the wickets and showed good judgment of when and how to attack on a pitch that gave him little pace to work with. Aaron Finch was a little less certain, and ultimately fell lbw when trying to flick Holder off the stumps. Usman Khawaja’s cameo was attractive until he got an ugly front edge off Benn. An offspinner from Narine – sliding down leg – had Smith lbw. Maxwell played loosely at a sharp offbreak from Narine, leaving Mitchell Marsh to help Warner cobble the final few runs as the floodlights took effect. Nevertheless, it was a commanding margin: six wickets and 24.2 overs which meant Australia took a bonus point in addition to the victory itself. It is hard to see Lyon and Zampa being dislodged from the XI for the remainder of the tournament, let alone Tuesday’s match against South Africa.